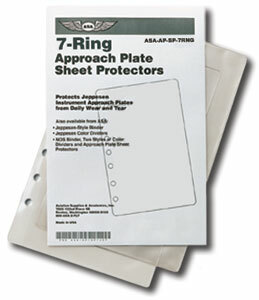 Made of translucent plastic to protect the most frequently used 7 ring style approach plates from wear and tear. These durable, translucent plastic covers protect your most frequently used 7-ring-style approach plates from wear and tear. Sold in packs of 10. These have a single pocket opening on the ring-punched end.